Barry Levinson’s Diner Turns 30! 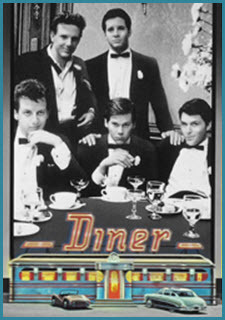 OK, so most of you bloggers are far too young to remember when Barry Levinson’s groundbreaking film Diner first graced the silver screen – but, if you’re any kind of film buff or cinemAddict, you’re seen it at some point since then! To commemorate the 30th anniversary of Diner’s release, there are a number of events this week around town – culminating in an “Open Conversation with Barry Levinson” right here at Shriver Hall on Saturday, December 10th. Visit the Maryland Film Festival’s website for additional information and to purchase tickets. Want to investigate Levinson’s work ahead of time? The library has copies of his films and books by and about him. You can also use resources on the Film & Media Studies Research Guide to find background information and journal articles. And, if you’re a musical fan, guess what? It’s being adapted for Broadway – no kidding! Hopkins’ Instructor Featured at MD Film Festival!